I had never made a carrot cake until yesterday – shocking I know. There were two reasons for rectifying this situation. 1) On the last day of term at school we had lots of carrots left over from the free fruit and vegetables scheme for children in Key Stage 1 so I decided to grab some (thinking I’d actually feed them to the rabbit!) so I had plenty of carrots spare and 2) One of my good friends has just discovered her 6 month old baby boy is dairy intolerant. She loves cake and is missing out so I promised her I would investigate some dairy free cake recipes. After some searching on the Internet I have discovered it is hard to find dairy free cake recipes and when you do find them they require lots of special ingredients (like dairy free spread etc.) Luckily, I came across this BBC Good Food recipe that uses oil instead of butter and uses an icing made with orange juice and icing sugar rather than the traditional cream cheese frosting you might expect to find on a carrot cake. It’s an easy recipe that only requires a couple of bowls (one for the cake and one for the icing). You will need an 18cm square cake tin, with the sides and base oiled and lined with baking parchment. (The recipe recommends using two long strips of paper crossed over making a double layer on the base.) 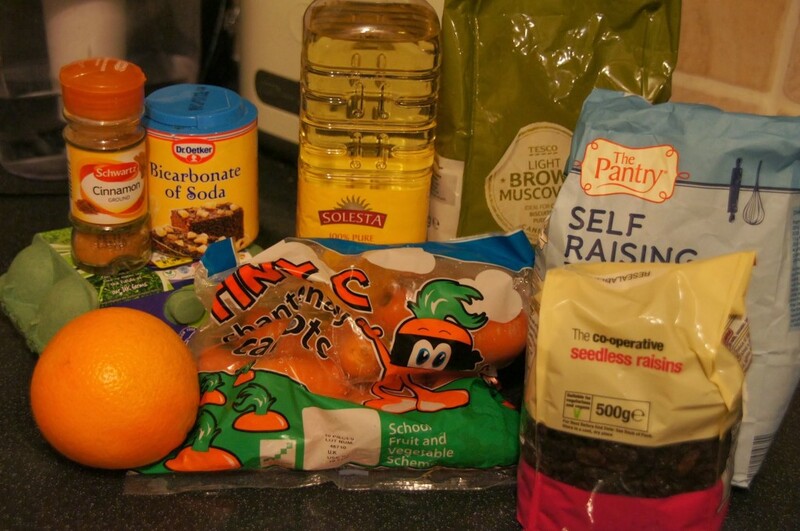 It produces a lovely moist cake and the orange icing makes a tasty alternative topping. 1) Preheat the oven to 180C/Fan 160C /Gas 4 and prepare your cake tin. 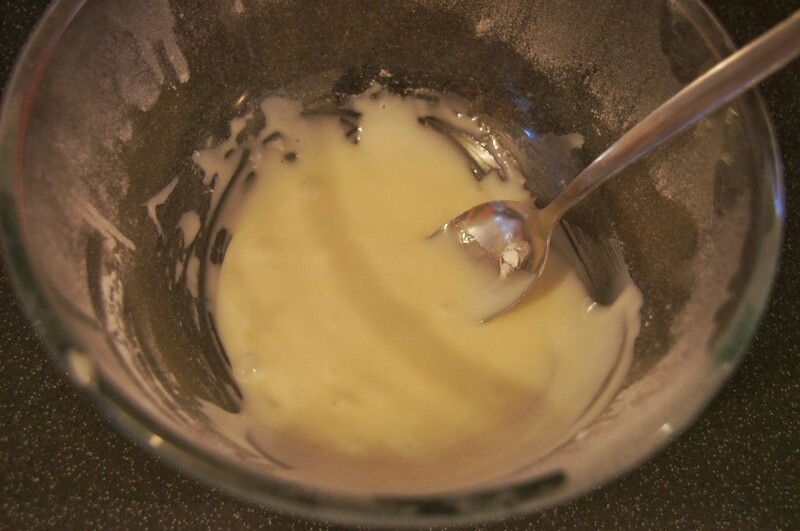 2) Tip the sugar into a large mixing bowl, pour in the oil and add the eggs. Lightly mix with a wooden spoon. 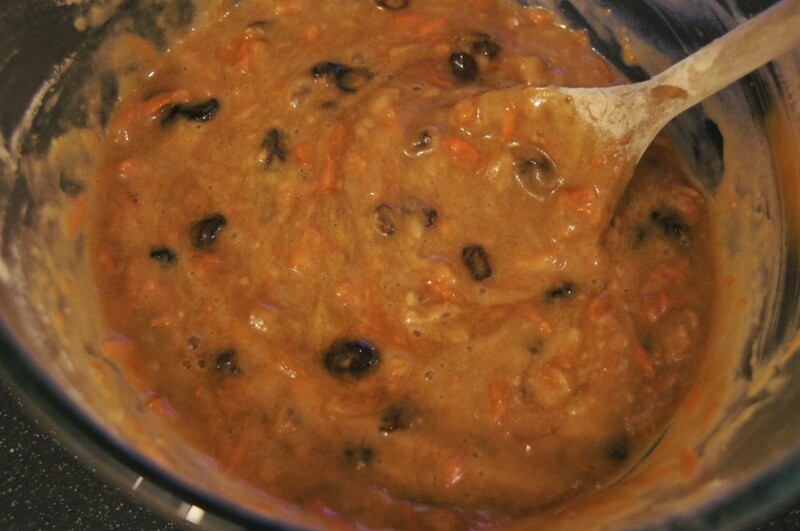 Stir in the grated carrots, raisins and orange zest. 7) Once the icing has set slice into pieces and enjoy!